Well, your teacher has obviously been playing for a while, and has actually heard and played the instrument and been able to examine it up close and in person. So she would be advising you based on a far better idea of the varnish than you can give to us here. So far as the actual luthier you mentioned, it might be worthwhile to call and ask how much he would charge to just check the instrument over, and after he has had a look at it, he'll probably be willing to give you advice on what should be done and an estimate of how much it is likely to cost. That way at least you'll know what you are saving up for and how much to save. He'd also know if it should be refinished or if it just needs a good bit of playing to "open up", since you apparently want a second opinion on that. Thanks for the reply Daniel, I trust my teachers advice all the way honestly as she's been playing for over 20 years so her thoughts are first in my mind yes absolutely. She didn't really mention or go into having it re-finished at all, it's me that's curious about that part. She does think that it will open up with time and playing on it frequently, I am just a bit of a perfectionist I guess lol. I know that what she said doesn't mean that it has a terrible sound but it obviously means that it's not what it 'could be' which triggered my brain into overload of 'oh man, gotta get it fixed' lol. I mainly just wanted to pull from all of the resources here to see if anyone has had a violin with the same 'issue' if it could be called that. I've got an e mail in to the local Luthier about the setup/re-finish quote as well. I just also didn't want to bug my teacher about it as I'm sure she's very busy till next week. but, a luthier will tell you what the violin wants to play well... and thru trial and error it will come around. Finish is a touchy thing. sometimes a good french polish can remove a nasty build up of poorly applied low quality varnish, and sometimes a good workover with oooo grade steel wool to smooth and remove the escess and then a french polish job would be more than adequate. Removing the varnish with sandpaper is a NO-NO, as is using stripper, etc. A luthier will usually use a scraper if the build up is really bad but most of the time a simple alcohol wipe will suffice. An expert will tell you what the violin wants and needs. It's money well spent. Hi, Chris... 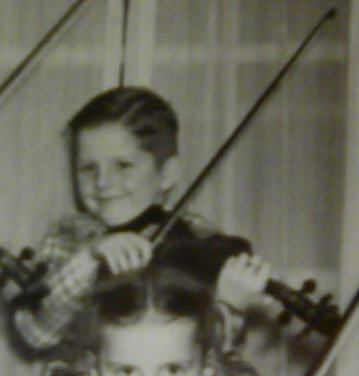 I took a violin to, Psariano's about 10 year's ago to get it appraised, it belong's to a friend, but taking it there 'at that time' was a chore, I could never find them as having normal 9 - 5 business hour's. 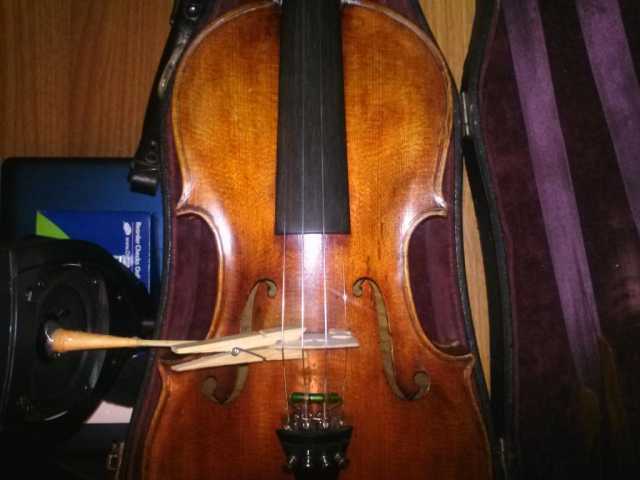 I have a "Caspar da Salo" violin that's been in my family, well, let's just say it's around 130 years old. I thought I had a real gem of a instrument and but when the luthier 'not Psariano's' checked it out, he told me the sound was kinda muffled and dull, not bright like he figured when he first looked at it. That luthier was on Middlebelt, S. of 5 mile rd., I know you're familliar with that area. I think I mentioned and luthier in Birmingham when we chatted in the shout box. " Wilson's Fine Violin's", in Birmingham. Rob Wilson is a pretty straight-up guy and he's very knowlegeable. From Dearborn take Telegraph to 696, E. to Woodward, N. on Woodward past 14 mile to Adams Rd., Wilson's is on the right in a small shopping plaza. Alot of thing's can be done to improve the quality of sound of a violin, in most case's, but my Caspar, I think there's no hope for, that's the reason I bought a new violin from Fiddlershop. Cdenny - I have been keeping that in mind that she plays but is not a luthier for sure, I think I will definitely be taking it to an actual luthier instead of the last standard 'music shop' I took it too last time, thanks for the advice on the finish. If that turns out to be the problem I may have no choice but to work it down a bit on my own. Have been hearing that the costs are quite extensive on any more 'serious' repair work but we shall see. Ken - Hi again . Psarianos does have some very uncommon hours, I got an e-mail back from them stating that it would be best for me to call them, set up an appointment for an estimate and go from there. I'll have to look for the luthier on Middlebelt because the place I take my lessons is right in that area as well. Could even be the same place (Cameron's Music) as they told me they have a luthier that comes in there and does work for them. I'll have to check out Wilsons as well, I know that is right in the same area as Psarianos, thanks for the directions out there! Those will help a ton. Unfortunately if it does turn out that my violin can't be fixed or would have extensive costs involved it'd be the end of my journey for a while. Lucked out getting this violin as it is and funds for a new one are out of the question but keeping my fingers crossed . So, don't say there's no hope... this is the sweetest sounding violin of the 5 I currently have laying around here at home. I definitely won't give up hope easy that's for sure lol. That violin sounds very sweet, love the sound! The funny part is that your old case looks very similar to mine now. Maybe it's because I'm still so new but to me the sound on mine sounds very nice as it is honestly. I of course want it to sound like it 'should' but if I can figure out how to upload an mp3 here I'll post it up in here in a few. As you've heard from everyone above, the sound-post placement is extremely important and will affect the tone tremendously. I move most sound-posts on our violins at the shop to find the ultimate fit and location and there is no doubt that you can make the sound much better by finding the sweet spot. You should be able to find a luthier who will move it for free or for very little. I know that I would. Thanks Pierre, I've actually talked to one of the luthiers around the area and he quoted a fairly high price just for adjustment (probably because of his recognition/skill vs. workload) but the other one that Fiddlesticks mentioned said to just swing it in to take a look at the position etc. I have done some things in the interim to greatly improve the sound, thanks to MadBadDaniel on here . I followed his thread about making a DIY Tone Rite device and all I can say is WOW, same with my teacher. It's made the violin awaken from it's long 'Slumber' and is playing very nicely. Still have it hooked up when I'm not playing to try and increase the effect. I am so happy that I signed up here finally . Huge thanks to everyone for the advice and hats off to Daniel for the great project! 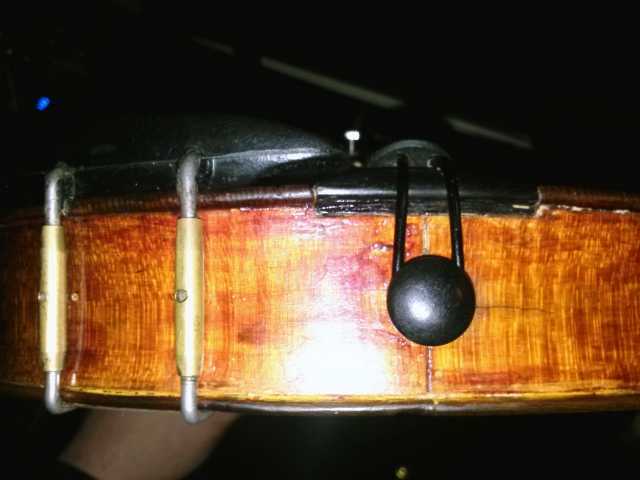 This is a very interesting comment you've made about the DIY vibration device making a noticeable improvement for your old violin. How many hours was the device used? Any other details about how you used it? How loud was the violin when being vibrated--similar to Daniel's account where he had to put his in a closet so it wouldn't bother anyone, etc.? I'm currently running my (genuine-non DIY) ToneRite on an old violin that hadn't been played in probably 30+ years, hoping it will wake it up like yours did. Steve - I haven't honestly kept an exact log of the hours I have had the device on my violin, though it would be around at least around 72-80 hours. I left it on the violin in my studio/room non stop at close to full volume which was fairly loud when hooked up to the bridge. When I close the door you can't really hear it much at all. I do have acoustic treatment in this room as I do audio production/recording from here so the sound doesn't have much room to escape at all. The speaker is hooked up to my old phone with an all classical internet radio station playing on it. Hope this gives you a better idea of the setup. It definitely did 'open up' more than when I first picked it up. The sound has a very full tone to it now where as before it was very choked. Still has a ways to go I'm sure but for now it sounds great as the experiment continues . Thanks very much for the details and the good photo of what you did for your DIY play-in device. I'll eventually try to build one for myself and compare it to my ToneRite. Steve - No problem at all, glad the info is able to help out a bit and at least from what my newbie ear can tell there is definitely a sound difference now. I'll eventually post another sound/video clip of it now, after the 'play in' when my nerves aren't in the way and I have my next song worked out lol. Update to the repair scenario - I took everyones advice and checked around at several of the luthiers in this area and I have to say thank you to Ken (Fiddlestix)! Wilson Fine Violins will be my new 'hometown' luthier, he's been so helpful thus far there is no comparison to any of the others. Shockingly one of the shops wouldn't even call me back and when I went out there he was 'too busy' to take any time to look over my violin . All sorted now and it's actually going to be VERY cheap to get the sound post adjusted like you said Pierre. There are some 'seam issues' on it as well but after sending some detailed pics of these areas he was able to tell me what it would roughly cost to repair them as well. Once again WAY below what I was thinking. Thanks again all and here's to furthering the journey . Hi, Chris,,, I'm happy, Rob Wilson, did well for you. He's a straight up guy, he has a great business there, with very nice employee's. He'll take the time to help you out. I bought a $65.00 shoulder rest from there the first part of January, the girl who sold it to me, which I had never seen in there before, told me to take it and try it for a couple week's and if it didn't work, bring it back. Two week's later I returned it, Rob was there then and I explained to him that it just didn't work for me, he said, no problem and refunded my money. We talked a good 45 minute's about what I was looking for in a shoulder rest. I told him about "The Slipper", shoulder rest, he wanted to see one so I told him he could see one on "Fiddlerman.com", he must be logged onto that site, because he immediately popped it up on his computer, he didn't even have to type it in. Maybe he's watching us. Anyway, I'm happy you enjoyed your experience there. Woohoo! 1st series of repairs are done! The bottom seam separation has to be done at a different time I guess as it would be too traumatic for the instrument all at once but the other separations are gone and boy, what a difference! The luthier also moved my bridge and sound post and put new Evah Pirazzi strings on it. It literally sounds like a whole new violin! I can't keep my hands off of it, wanting to practice 24/7 now! Thanks again all for the great advice/encouragement! I'll try to put another sound clip up of the 'restored' beauty lol. Chris,,, did Wilson's do the work for you ? Hey Ken, this first set of repairs was actually done by my new violin teacher I just started with (had to separate from the last one due to unreliability with our time slot) who's been doing work on violins, violas and cellos for about 40 years now. Did an outstanding job on the open seams/sound post adjustment. He wasn't able to repair the end area and sent me out to Rob Wilson, found out why when I was there today . Wilson's WILL be doing my next set of repairs though, new bridge (as mine is a bit high right now), new bow rehair as well as correcting a slight warp in the stick and a full cleaning/french polish on the violin. Lets just say that the repair of the end seam/block and rib would cost more than your average professional series violin, bummed out cause I can't afford it but like he said 'It's not really broken, so no need to fix it' lol.